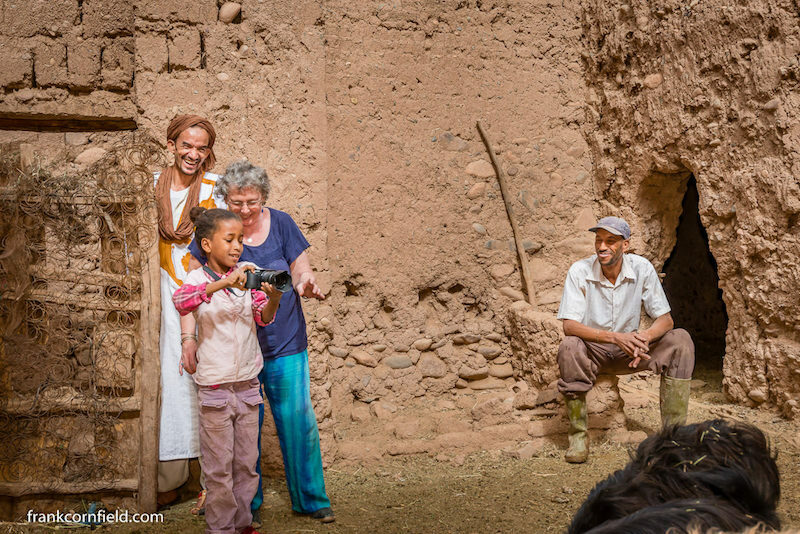 Our guest blogger, Margaret Cornfield, tells the story of visiting two homes in Tamnougalt, Morocco. The Cornfields, Open Doors Morocco, and our good friend Mustapha in Tamnougalt managed to provide much needed roofs for two homes in the village. Margaret tells the story best. We went on a trip organised by Open Doors Morocco with Said Ahnana as our host. This had been planned with his and Nancy’s help as we wanted to visit the Anti-Atlas regions of Morocco. We had heard that the company had a strong community ethic and had a policy of donating a percentage of its profits to the communities through which it passes. 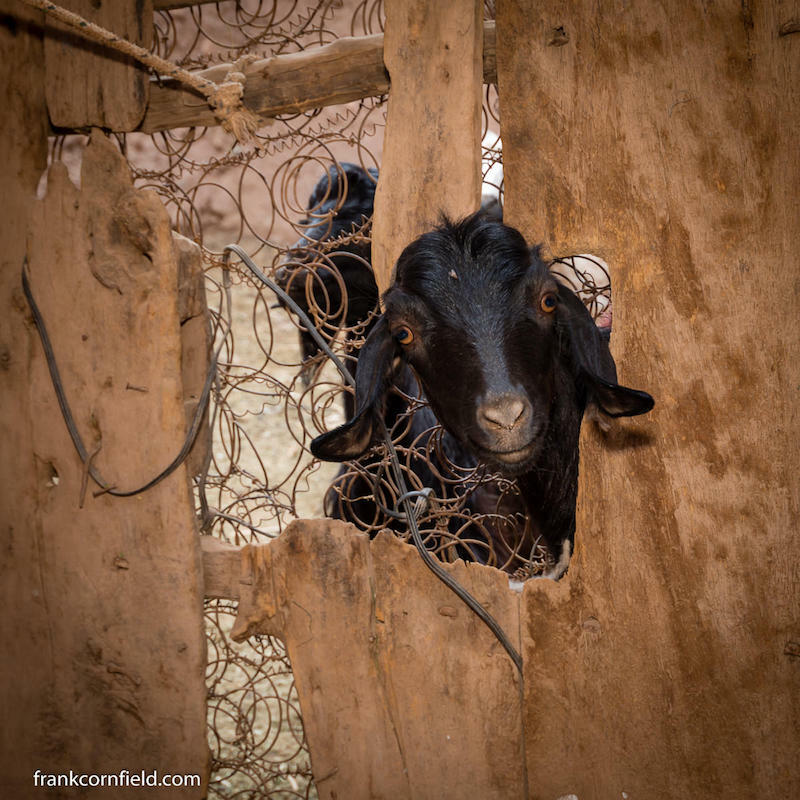 My husband, Frank Cornfield, is a photographer, so we thought it would be interesting to follow one of the projects. Nancy told us that the money raised by our trip would be helping in part to the reroofing of two houses in a small village in the Draa Valley near Agdz. We requested that we could visit this town and maybe meet with the beneficiaries and photograph them. The location fitted in nicely with our projected trip to the Anti-Atlas, so all was arranged. This visit proved to be one of the highlights of our trip. We met some rather special people and Frank managed to take some wonderful pictures, so everyone benefited. I felt included in the projects and that I was not just a tourist passing by. Because of our trip two families had more space in which they could shelter when the cold winter winds blew and the rain fell. We arrived in the village in the late afternoon and were taken to our home for the next few days. This was in an old traditional kasbah (fortified home) owned by Mustapha Kassi which he runs as a small guest house in the ancient part of Tamnougalt in the Draa Valley. Mustapha had found the families requiring help for Open Doors and was overseeing the projects. The stay in Kasbah Maktob was in itself a delightful experience as we were treated very much as part of the family, a small party being arranged for us and two other guests with delicious food, berber music and songs. Mustapha guided us the following day through the alleyways between the mud-brick buildings, most of which were in ruins and deserted. He explained that the people who used to live there had moved on, either to new-built buildings in another area or away from the village altogether. 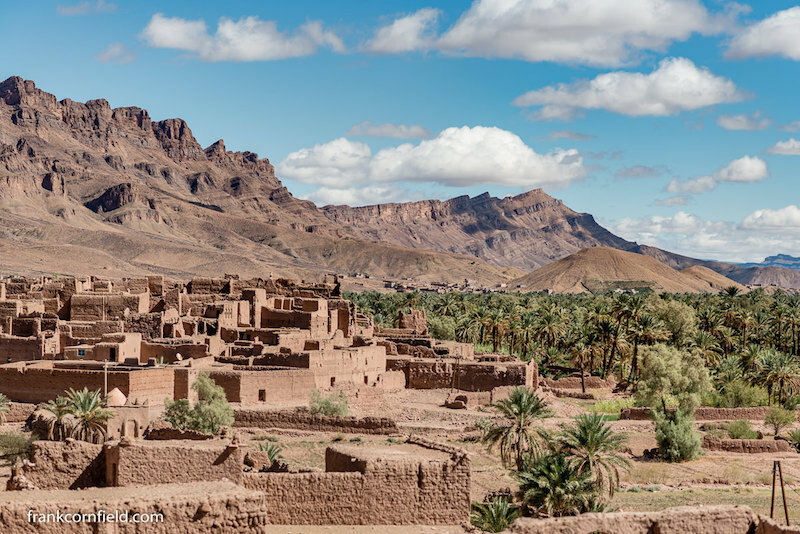 Tamnougalt used to be the capital of the region and its assembly of families (the djemaa) administered the area until it fell foul of the Glaoui family of Telouet who had designs on the whole of the Draa Valley. The local Berber tribe is the Mezguita, which still inhabit the area, and the Kasbah des Caids is able to be visited and is considered a showcase of traditional architecture. 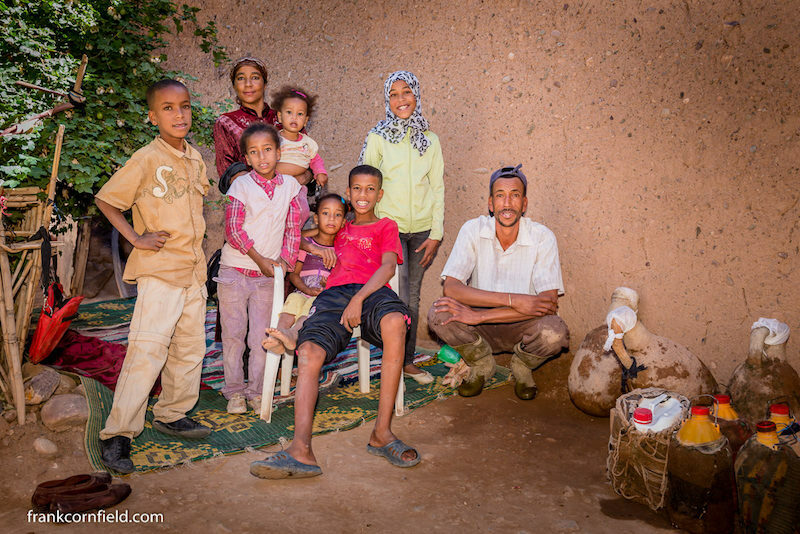 We first visited Mehidi and his wife Touda and their six children aged 15 – 1½ in the dilapidated kasbah which they inhabit in the old part of town. Whilst a kasbah may sound very grand, the kasbah is not owned by the family and there was only one rather damp room available for them to sleep in. The project was to roof another room which they would all move into, renovate the existing room, and then they would have two dry areas in which to live. Mehidi started working when he was 12, after his father died, as he was expected to help look after his family. Initially he worked as a labourer for others, learning the skills necessary for the mud brick construction used in the buildings. Nowadays he works for himself, but work is not plentiful as many of the owners of the surrounding buildings are not interested in renovating them as is the case with his own home. The buildings are just left to decay, which is a shame, as they are often beautifully decorated and can be kept quite comfortable as long as they are maintained. 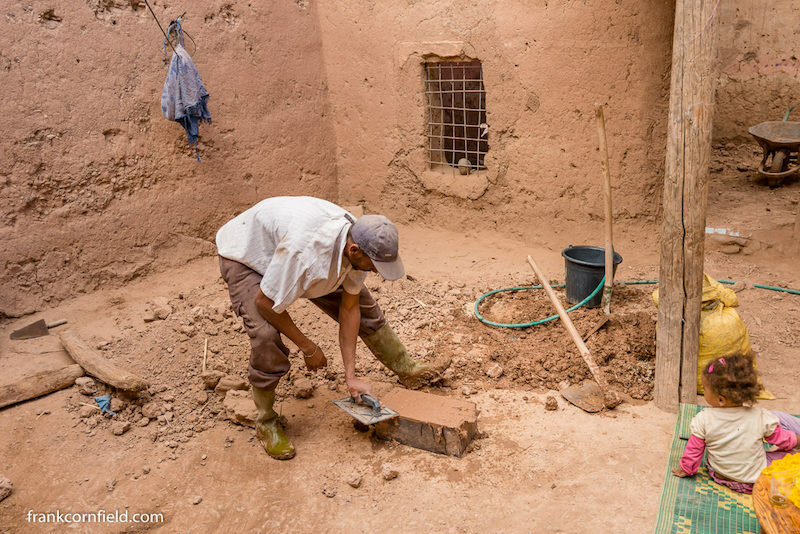 Mehidi was already starting on the work required for his own building and would be carrying out the work on the other building being funded, so this project was not only going to give the family more space but also Mehidi more work. It was also keeping two old buildings alive and used. He showed us how the bricks were constructed by mixing chopped straw and clay mud, putting the mixture into a large metal mould, stamping it down and then turning it out to dry for two to three weeks. These large solid bricks would then be used to form the walls. The ceilings would be made by using time honoured traditional techniques using date palm tree trunks, bamboo latticing, and at least two layers of clay mud. A layer of plastic between layers would be a concession to modernity. All materials were to be sourced locally. We were invited to look around the rest of the kasbah. 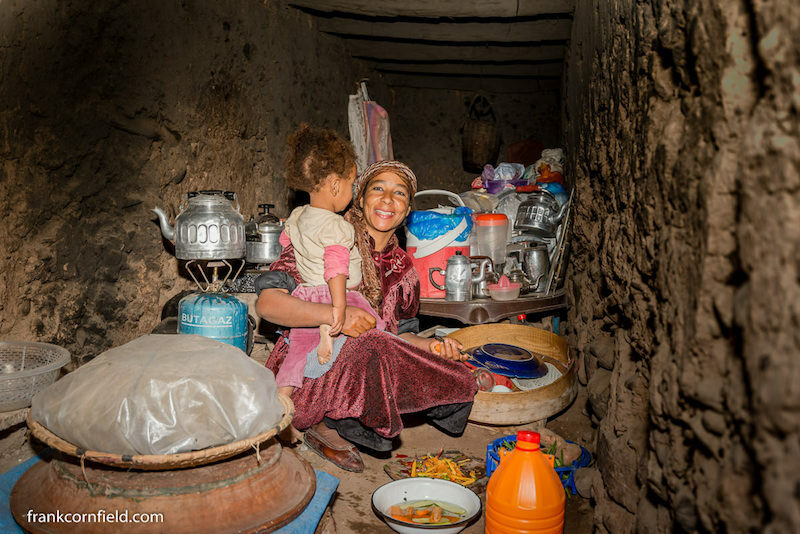 Touda had a long dark room for her kitchen where were also stored the fruits and vegetables. She cooked on a small clay oven over wood. There was a tap in the courtyard where she could access water to wash the dishes. There was an area in the lower kasbah where the animals were kept – the family had one donkey, two goats and four sheep and one pet rabbit. Many of the other areas of the building were in obvious need of repair, but funds would not stretch to that. Our next visit was to another kasbah owned and inhabited only by one woman, her name Aisha. Aisha, a lady in her mid-50s, met us on the road to her kasbah and never stopped talking most of the time we were with her. She smiled and laughed a great deal, and talked to us as if we could understand. Mustapha was the interpreter, but it was obvious she wanted to connect with us, and laughed over the language difficulties. 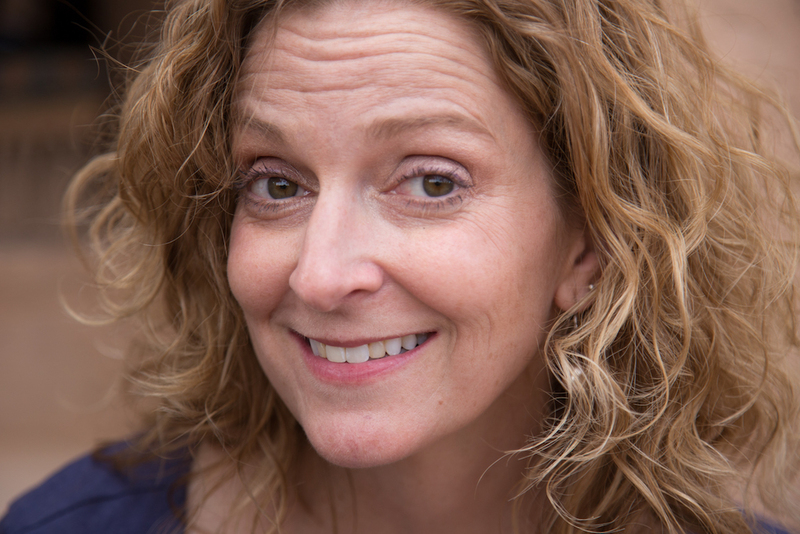 The body language meant everything – we were welcome. 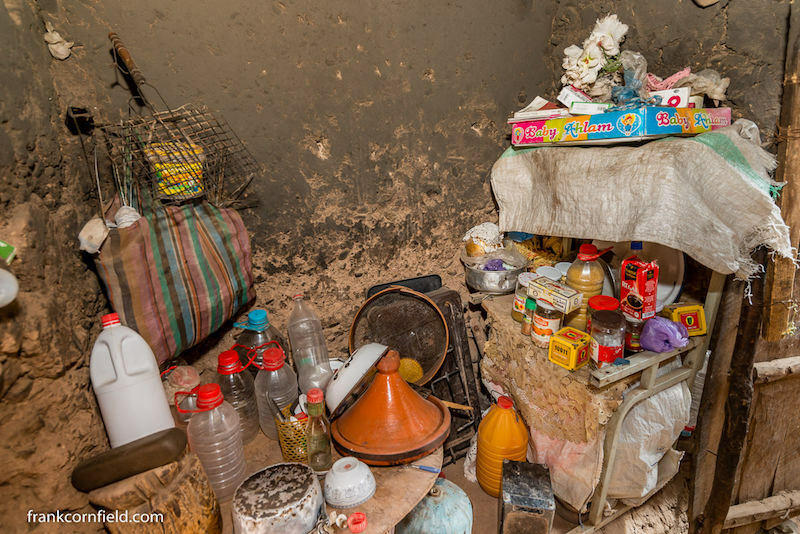 Aisha is a single woman on her own with no income living in what was a beautiful kasbah, but which is now falling apart. She lives on the top floor in a couple of rooms which leaked water in the winter because there was no plastic sheeting between the slatted bamboo and clay/mud straw layers. The project was to waterproof her rooms which would entail a reworking of the ceilings. Aisha has her kitchen also in this area, using a similar mud brick stand as with Mehidi’s family but also a mud brick kiln for bread. There is no running water so all water has to be brought up in pails or bottles over the 3 floors. 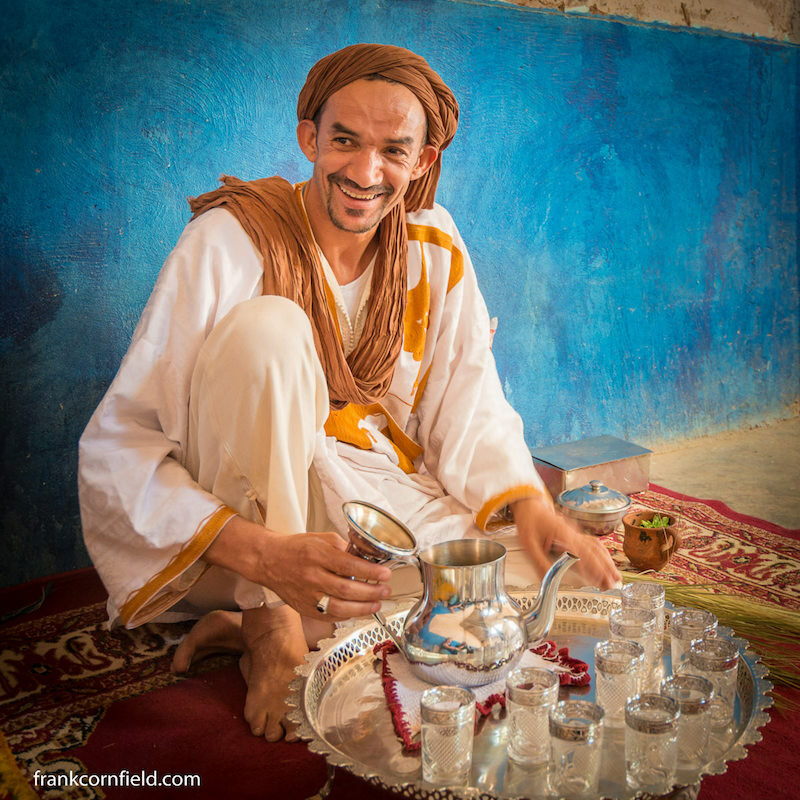 I learned later from Mustapha that he has bought a nearby kasbah which he plans to renovate to allow artists to live there, and he plans to extend the water system to Aisha so that she can have running water. I asked Aisha if she were not afraid to live in the kasbah all on her own but she laughed. She started singing loudly to herself and danced to show me that she could do that without caring what anybody thinks. She showed me a small archaic TV that she treasures and reassured me that she is not afraid to live there alone. I came away from our visit with mixed feelings. I saw the way two different families were living and hanging onto the old lifestyle, mostly because they had no choice. If it had been possible to transport them out of their situations and give them a comfortable concrete house which was infinitely more manageable, would that have done them any favours? As they were, they were living in the old part of the town, keeping the old buildings going. These people were poor, but they were determined to make the best of what they had. They laughed at life and appeared grateful for the tiny ways our money could improve it for them. Thank you Aisha, and Mehidi and family for allowing us to meet with you and learn about your lives. We will not forget you. And thank you Open Doors and Mustapha Kassi for making this experience possible for us. My name is Margaret Cornfield. I live in the small village of Killin in the Scottish Highlands, and I am a friend and customer of Open Doors Morocco. My husband, Frank, is a photographer and we have known Said for a few years and found him to be a wonderful guide and companion. His grasp of what makes a holiday exceptional is unrivaled and I am happy to support him and his team in the building up of what promises to be a company that really opens doors for both the client and the communities through which it passes. If I had a choice, I would spend more time in Morocco. I lived there for about six months when I was in my late 20s, and have visited several other times. However, as that is not a possibility at the moment, it is a real privilege to be able to be involved in a very small way in helping a young company develop and to keep a connection with a country and people that I feel truly in love with.